The bulk of preparation effort usually goes into the main content of a message. We wrestle with the text, we allow it to shape our theology, we think through how that content marks our lives, we ponder all this in light of who will hear the message. This is all work on the points, or movements, in a message. Then perhaps we ponder illustrative material to help make sense of those movements. We consider how to introduce the message. We might even give some thought to how we will conclude it. 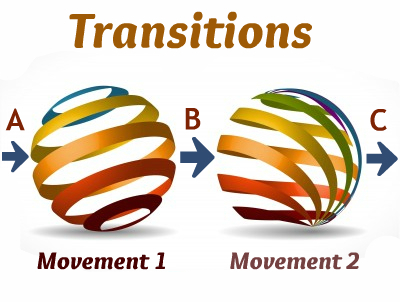 But often there is too little thought given to the transitions between movements in a message. These are represented by A, B, C on the diagram. Too little attention given to these little moments will result in too great a negative effect on the whole message. Great messages bomb because of poor transitions. 1. Emphasize clearly. The listeners need to know that you are moving from whatever introductory material you have given into the first movement of the message. You can do a star jump, pause for two minutes and turn to look at a powerpoint slide. Or you can be less awkward. Vocal variation can serve to underline your shift effectively: perhaps a pause, a change of pace, a variation in pitch. You can say, “So for my first point…” but that is probably hinting at dullness already. But something along those lines could be helpful: “So let’s see how the passage launches . . .” could work, as long as people catch what you just said (so think through how to add emphasis). 2. Preview appropriately. What is appropriate depends on the type of movement that will follow. If you are presenting a declaration and then supporting it, as in a typical deductive message, then you might be able to simply offer a preview of the point by stating it and telling what will follow (i.e.explanation, application, etc.). By previewing and then re-stating the point as you progress, listeners will spot the entry into a section of the message. If the point is the development in a narrative, then you may not want to give it all away at the transition. You need to decide how to make sure people are with you as you enter in. Perhaps a question that will be answered – some variation on “so what happened next?” might work. 3. Introduce confidently. Whatever you are about to say, convey confidence in how you introduce it. Don’t apologise. Don’t downplay in some supposed act of humility. “Oh, I guess I should probably say a few words about . . . ” Uh, no. “Just a disconnected story first before we get into . . .” Again, no. “I wasn’t sure where to start, so. . .” No.